More shoppers trust Amazon than Google with their credit card data. Despite its recent push into the mobile payment market, shoppers have difficulties trusting Google more with their credit card data. That is the conclusion of a recent CreditDonkey.com survey of over 1,000 online shoppers. People buying goods online were asked which companies they trusted more with their credit card information, and Google was far behind. Only 5% of respondents said they would trust Google more, compared to 60.3% saying that they trust Amazon more. "The longevity of being an online payment provider might explain the disparity," says Charles Tran, founder of CreditDonkey. "Unlike Google, which has a reputation for providing free top-notch online platforms like Gmail, Google Docs, and YouTube, Amazon has been holding users' credit card data for almost twenty years." Google did not score last amongst tech companies, however. Both Apple (4.5%) and Facebook (0.4%) were trusted less amongst shoppers. PayPal fared slightly better: 29.8% of respondents said that they trusted PayPal more with their credit card information. Most shoppers responding to the CreditDonkey survey were hesitant to trust ads on Google, Yahoo and Bing enough to use their credit card. 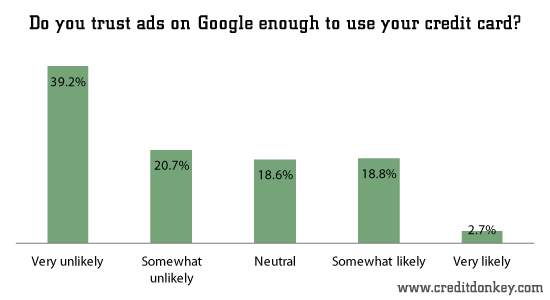 In total, 59.9% of respondents said that they were unlikely to trust ads on Google enough to use their credit card, and only 21.5% said they were somewhat (18.8%) or very (2.7%) likely to trust ads on Google. The rest were neutral on the issue. 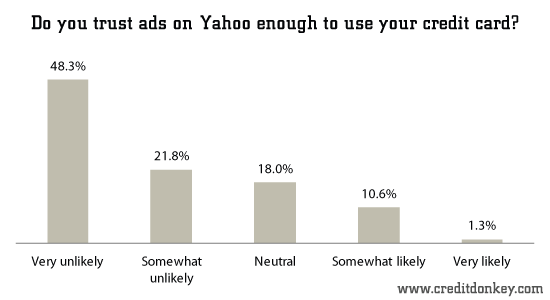 Yahoo was even less trusted, with 70.1% saying they do not trust ads on Yahoo enough to use their credit cards. Only 11.9% said that they would trust the ads enough to use their card. Similarly, 70% were unlikely to trust ads on Bing to use their cards. Google is the most trusted out of the three search portals. 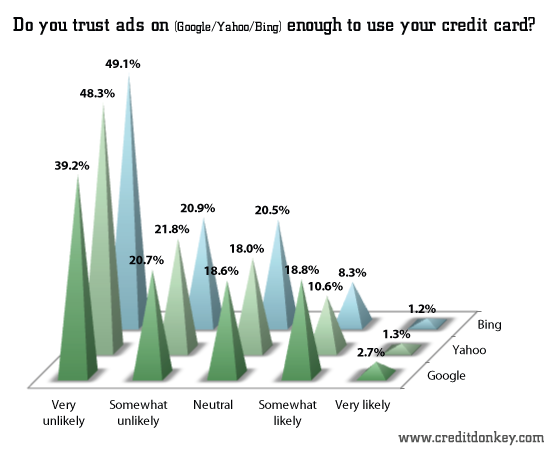 21.5% trusted ads on Google while only 9.5% trusted ads on Bing enough to use their credit card. CreditDonkey.com conducted the online survey of 1246 shoppers in the U.S., age 18 and over between August 20 and September 2, 2012. As consumers continue to shift their lives toward mobile phones, our new infographic illustrates key facts and figures behind the trend toward mobile payments. Online shoppers trust Amazon more than other well-known online brands, according to a new survey by CreditDonkey.com. 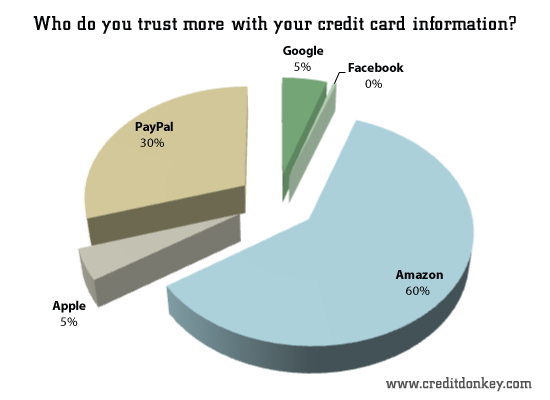 When asked what tech company they trust the most with their credit card information, over 60% chose Amazon. Share on Facebook "Google vs Amazon: Search Engines Struggle to Win Consumer Trust"